My ancestor 3xgreatgrandfather Kanohokai was a Mahiʻai who tended a loʻi at Kapena near Judd. I recently found his marriage record to Momona 3xgreatgrandmother and it listed their residence as Waikahalulu. Because of the proximity to his work, I assumed it was in the wailele area in Queen Liliʻuokalani Botanical Gardens near Nuʻuanu Stream. But now learning of these other traditional place names it makes me wonder because Momona’s known occupation was as a lei seller at the Honolulu Harbor. Their marriage is listed as September 21, 1866 and residence as Honolulu Wai ka Halulu. A visit to the tranquil Nu’uanu Stream park off School Street near Waikahalulu Lane will lend a peaceful and oft times trickling stream or two over a ten foot cascade, but this vintage photo depicts the low but wide waterfall in more of a roar befitting its name. What should have been a simple Facebook video upload that didn’t work – forced me to finally take the leap into YouTube to share this my first public video – Kauhimaka Ohana Family Tour: Visiting Kupuna. I’ll be adding future creations to my new ShakinTrees playlists. I’ll be collaborating with other cousins who also captured video at our recent tour to create more videos about our talk story tour that went from 8:30am – 3:30pm Sunday, February 18, 2018. Along with our Ohana matriarch, Winifred Jones – four generations of descendants of Joseph Kauhimaka and Sarah Kanohokai gathered for a tour to explore family roots in some of the places of significance. 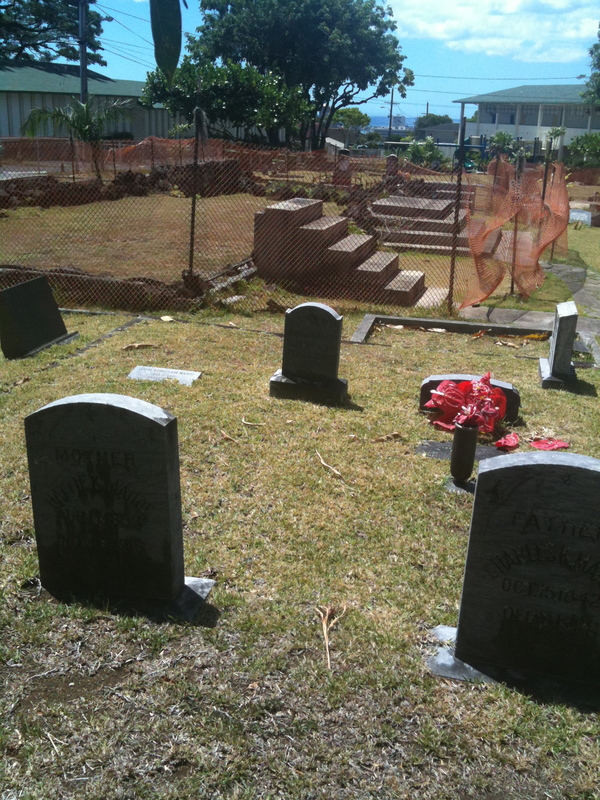 It isn’t everyday that you get to visit with six Grandmothers in your family tree in one day – granted four of them are conveniently in one place at Ma’eMa’e Cemetery Chapel grounds. I hope you’ll enjoy this and share your feedback with me.